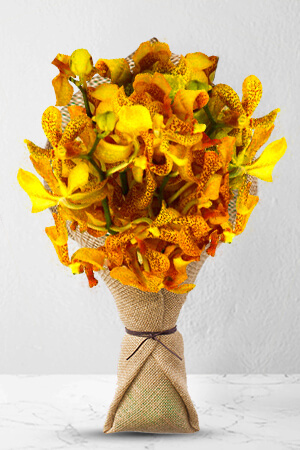 This bouquet of gorgeous Asian tiny spotted Orchids brings to mind a exotic tiger. This is the perfect gift for those that appreciate the unusual. Be prepared to impress when you order these orchids.Our bouquets do not include a vase. However, for a lasting impression, we recommend a Premium Vase to complement Tiger. This was the first time I ordered flowers online. I was a bit nervous because I wasnt sure about the quality of the service, the flower bouquet, and whether was going to be delivered on time and to the right address. however, it was all very nicely done. I was contacted and kept informed about the process. and, the flowers were beautiful. my friend was very happy...and I was happy too. thank you. The ordering experience was very easy, the range to choose from was great, and the recipient was very happy!